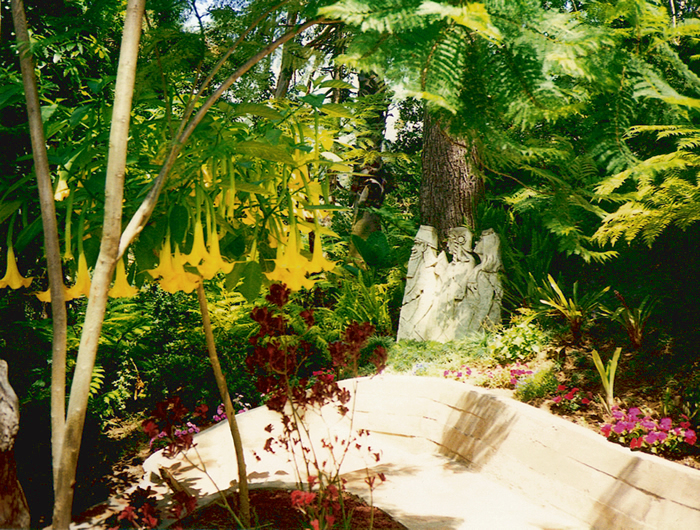 Garden and Landscape Designers Peter Dudar & Sally Marr have created one-of-a-kind gardens. 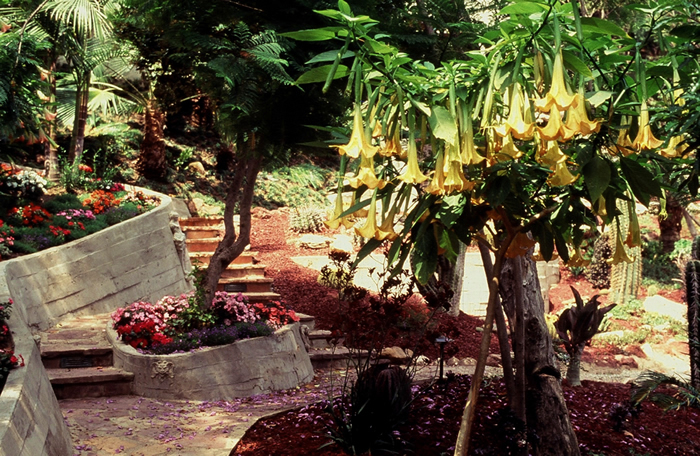 They designed and installed a paradise on a two-acre estate in the Hollywood Hills of California. 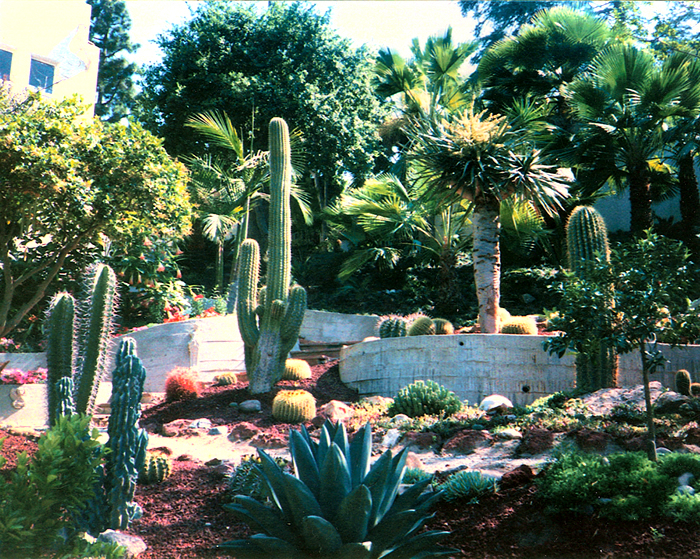 This garden was featured in Garden Design Magazine. 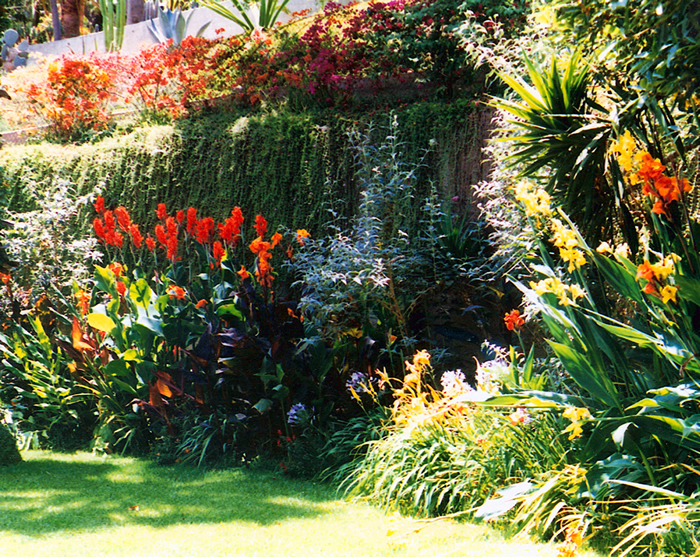 Please contact us for garden and landscape design quotes for your needs. 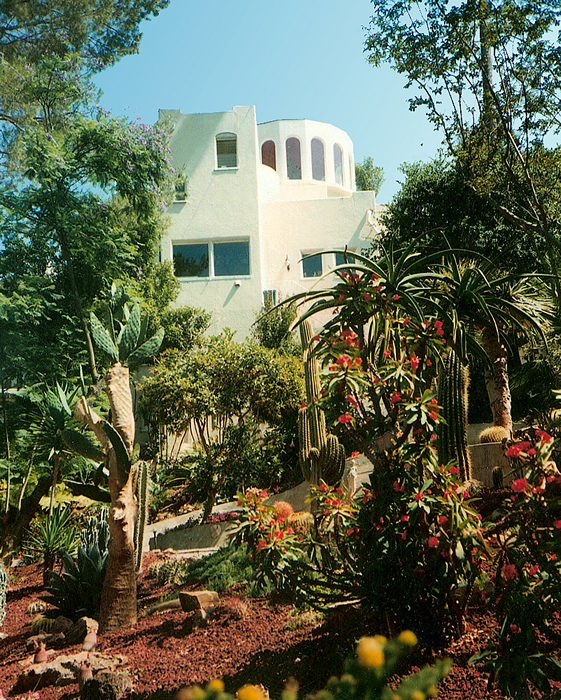 FLEAWORLD is a dazzling two-acre paradise at an historic 1920’s Moorish villa in Los Feliz. 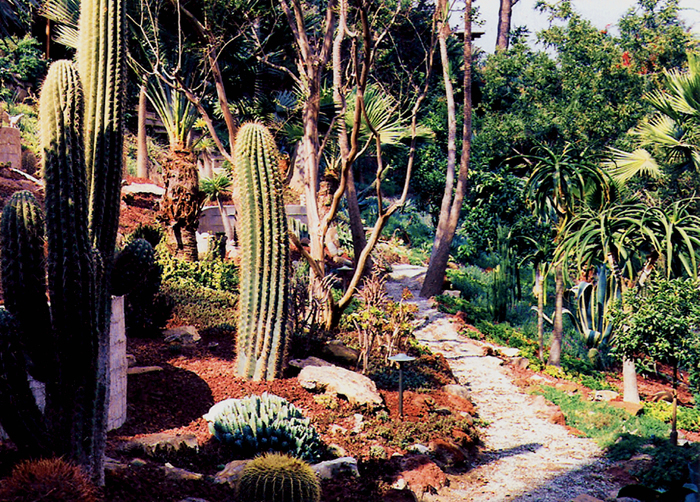 Created by Marr and Dudar for Flea of the Red Hot Chili Peppers, there are 12 unique gardens in one. 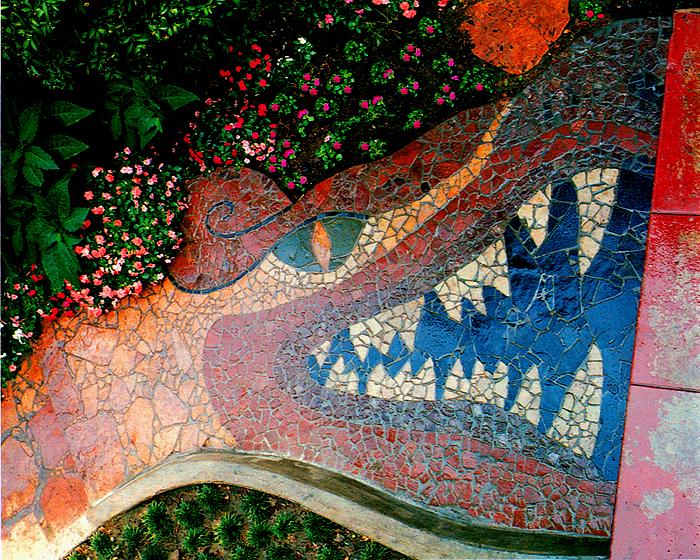 The artists designed a 300-foot-long mosaic dragon pathway that snakes down between a terraced Cactus Garden and a Rainforest (where sprinklers drizzle from tree tops) to a gingerbread trimmed Victorian playhouse surrounded by exotic flora. 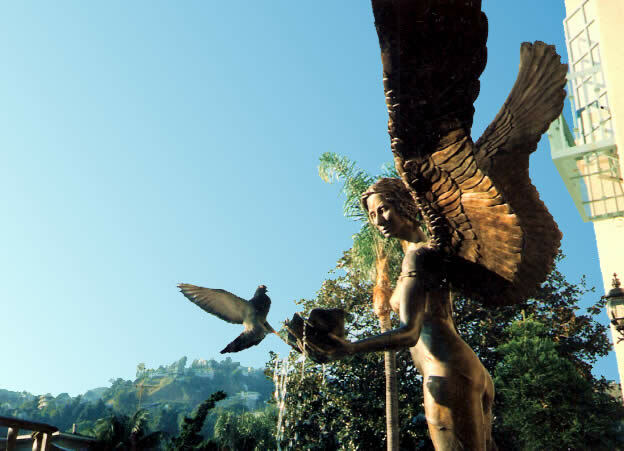 Mayan , Indonesian and classical artifacts and animals preside throughout the landscape. 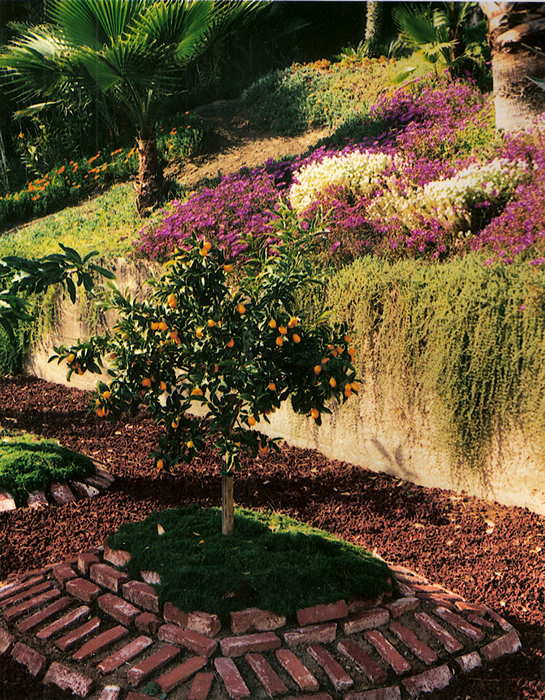 A dwarf fruit tree orchard arises from pyramids and a plethora of exquisite aromas engulf the garden air. 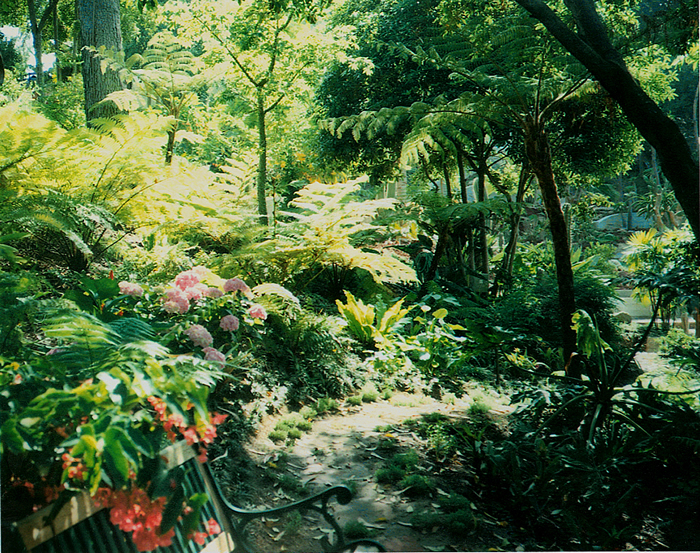 The knoll was adorned with spectacular hues of diverse ground covers. 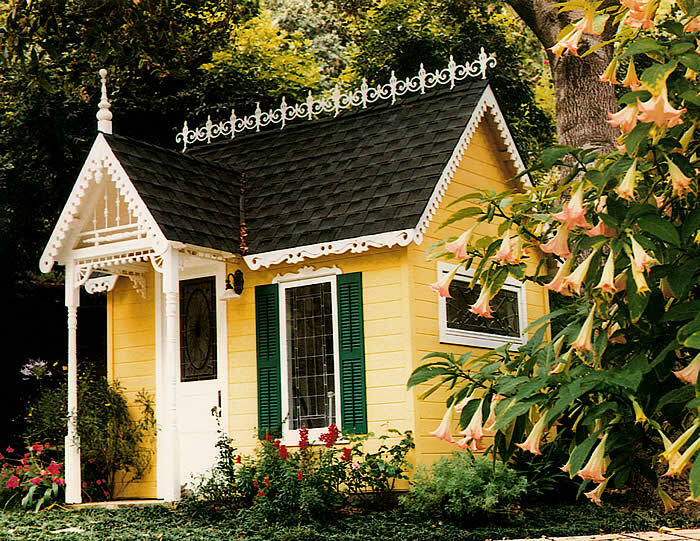 “It is a baby Huntington!” exclaimed Christopher, the last generation of Huntingtons to reside at the legendary Library and Gardens in San Marino. 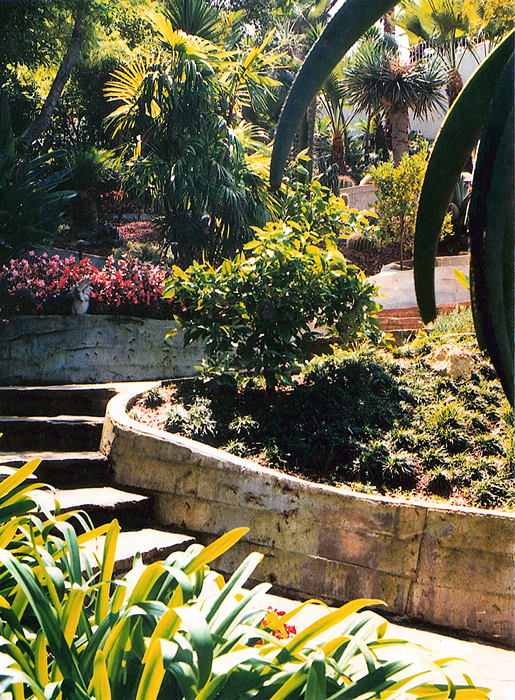 The paradise has appeared in garden magazines and now belongs to the Getty Family. 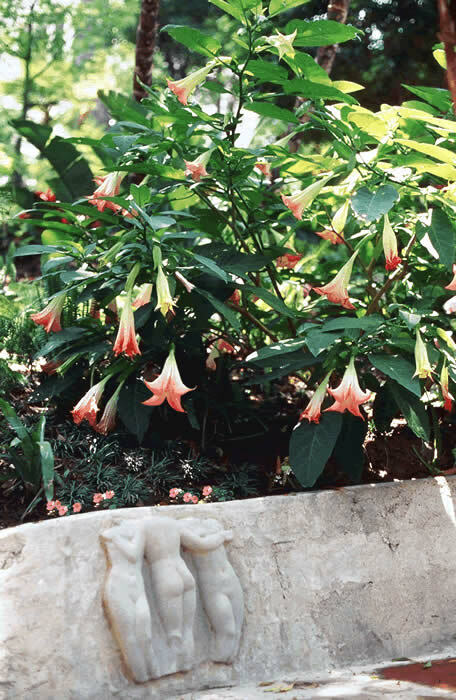 ISOLA BELLA GARDEN intoxicates the senses with perfumes of Madagascar Jasmine, Angel Trumpets and Burmese Honeysuckle. 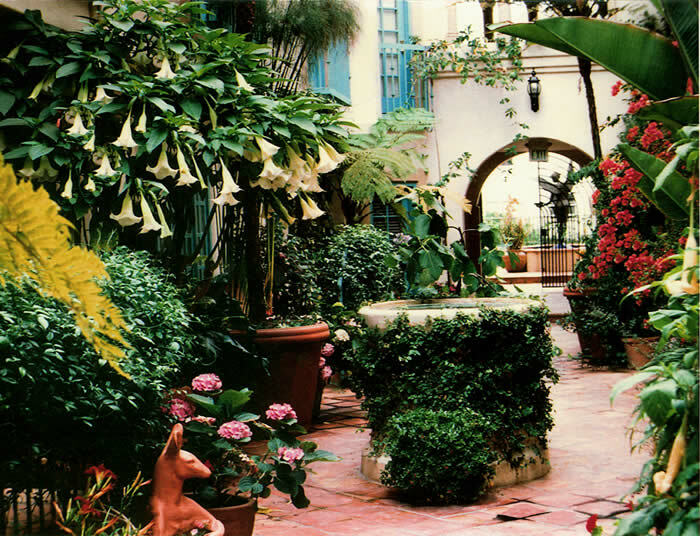 A myriad of 250 terra cotta animal and classical pots are home to an extraordinary palette of exotic plants, blooming trees, and fruit. 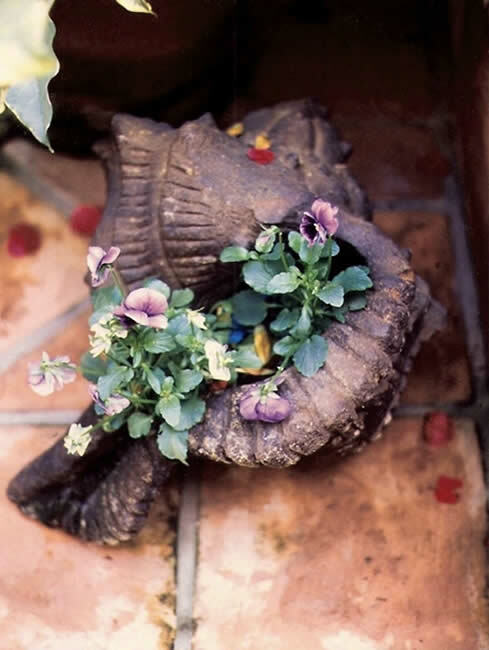 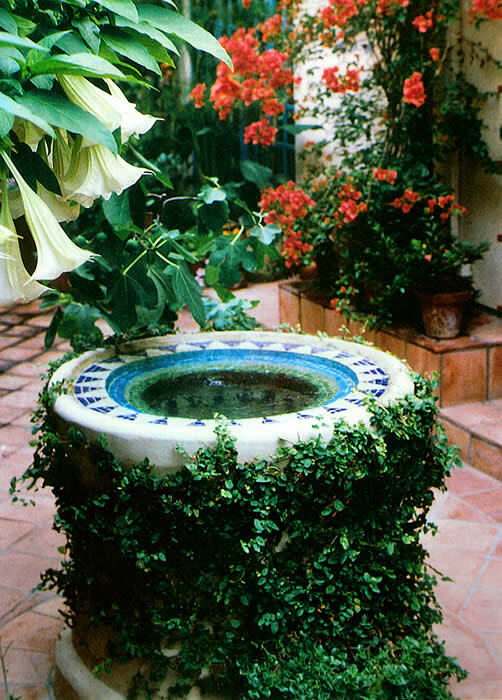 This courtyard, reminiscent of the gardens of Greece, Italy and Spain, offers a mosaic wishing well, lion fountain smothered in flowers and Marr and Dudar’s monumental bronze angel, “La Reina de Los Angeles,” residing in a pool of azure Brazilian tile adorned with saffron orchids to each side.